Ram’s Gate Winery in Sonoma Carneros opened for business in September, 2011. Located at the old Roche Winery site, the architect for the 22,000-square-foot, 30-acre project was Howard Backen, who has done Screaming Eagle, Meadwood Resort and more. 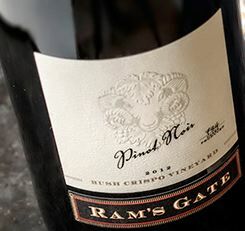 The name comes from the fact that Carneros means ram in Spanish and the winery is located at the gateway to the Carneros and Sonoma Valley region. The executive chef is Taylor Benham who develops small plate pairings for wine tastings to be held in the winery’s underground cellar next to the barrel room. There will also be an open kitchen for chef demonstrations, picnic foods and private wine dinners. 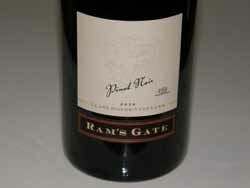 The initial winemaker was veteran Jeff Gaffner, previously of Saxon Brown, Xtant, Stephanie and Black Kite Cellars. In 2018, Joe Nielsen became director of winemaking. He was the head winemaker at Donelan Family Wines for nine years prior. 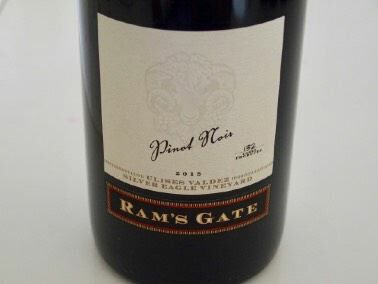 Multiple varietals are offered including a Carneros Pinot Noir, a Sangiacomo Roberts Road Vineyard Sonoma Coast Pinot Noir, and a Bush Crispo Vineyards Russian River Valley Pinot Noir. Additional vineyard sources are planned, including Silver Eagle in the Sonoma Coast, Diablo in the Russian River Valley, and Glass House in the Petaluma Gap. In addition, the winery has plantings of Chardonnay, Syrah and small lots of Cabernet Sauvignon and Zinfandel. Only a 40 minute drive north of San Francisco, this is certain to be a popular destination winery in Sonoma. Appointments for tasting are recommended and are held in the Covered Gallery, the Pavilion, the Pond or the Tasting Hall. 707-721-8700. 28700 Arnold Dr., Sonoma (just past Sonoma Raceway on the right).